Single-Sided Tape: For single-sided tapes, the backing can be comprised of a variety of flat web-based materials, such as film, paper, foil, fabrics, or foam. In many instances, the backing is treated with a release coating to enable stable unwinding forces, or with a primer to ensure that the adhesive sticks to the correct side of the backing. 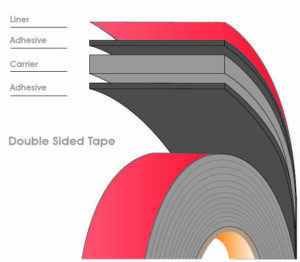 Double-Sided Tape: For double-sided tapes, the backing is coated with a pressure sensitive adhesive on both sides. The backing materials can be the same as any of those mentioned for single-sided tapes. A release liner is utilized to prevent the adhesives from sticking to themselves. The release liner is normally a silicone coated paper or filmic material. Adhesive: Typical adhesives are acrylic, natural rubber, or synthetic rubber. Special adhesives with a smaller application base are silicone, butyl, or EVA (ethylene – vinyl – acetate). Backings: A backing (or carrier) is a relatively thin, flexible, web based material. It can be made from various kinds of materials, such as paper, film, foil, foam, fabrics, non-woven, and laminates. Backings are often chosen due to the function they fulfil, such as cushioning, dampening, maintaining a barrier, etc. Release Liner: A release liner is mainly used with double sided tapes. Siliconized papers or films are the main types of release liners. The optimal liner choice depends on the application. If die-cut ability is required, polyester liners are preferable. If the tape is exposed to humidity, poly-coated papers are mainly used due to their dimensional stability. For most applications, paper liners are the liners of choice. Release Coating: The backing of a single-sided tape, and the release liner for a double-sided tape, are treated with a release coating. The release coating ensures stable unwinding of the tape during the application. This is very important for automatic applications in which the tape can be unwound at high speeds. A release coating can have different release forces for either easy unwinding or harder unwinding, depending on the customer’s needs. Adhesion: Adhesion is the attraction force between adhesive and substrate, which depends on the adhesive, the substrate, and the application conditions such as: application pressure, time period of pressure, and temperature during application. Cohesion: Cohesion describes the inner strength of an adhesive. It is relevant for applications where the force, in effect, is parallel to the bonding area. High cohesion goes hand-in-hand with high temperature resistance, low-edge picking, and high holding power or shear resistance. Tack: Tack is the wetting capability of an adhesive to the substrate at first contact. Tack is effective under minimum pressure and for a short period of contact time. For most applications, tack is not relevant because time is required to press the tape to the substrate. For applications such as flying splices in the paper and print industry, tack is an important criterion. Tack also supports adhesion on rough surfaces. The thumb test is often used to characterize an adhesive, even though it gives no indication of the adhesion or the overall tape performance. Shear: Shear is the ability of an adhesive to resist creep or slippage. Tensile Strength: Tensile strength is mainly important for single-sided tapes where the backing for the particular application has to withstand tensile stress. Carton sealing tapes or strapping/bundling applications are most important. The tensile strength of tape is usually not important for double-sided tapes, as long as the bonding materials are not stretchable. Elongation: Elongation is the percentage in which a tape can be stretched prior to breaking.